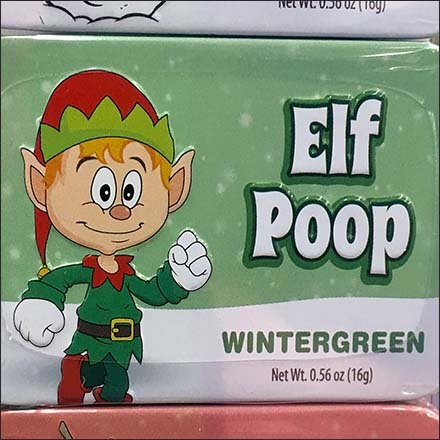 The retail outfitting might not be unusual, but the Elf, Snowman, and Reindeer Poop Merchandiser marketing approach is most certainly. Take your pick of three candy flavors of Elf, Snowman, and Reindeer Poop in Wintergreen, Perpermint, and Chocolate. No mere cheap novelty item, selling price was $7 a tin, testimony to the rarity and demand for Holiday Poop. This Elf, Snowman, and Reindeer Poop Merchandiser seen at Michaels.